“Unemployment” is a major economic indicator measuring how much of the working population is currently looking for a job. The unemployment rate is the most “tangible” economic indicator – if GDP is going up or down, it is harder for people to notice in their day-to-day lives. When the unemployment rate goes up, it usually means you or someone you know lost their job recently, which puts a great strain on individuals. One of the key goals of economic policy is to promote “Full Employment”, or bring unemployment down to its absolute minimum levels. 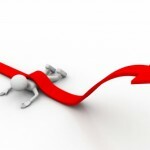 What Does It Mean To Be In The Labor Force? Not everyone over 16 is considered part of the labor force. The biggest factor is that a person needs to be “wanting to work”, meaning actually working or looking for a job. Full-time students are not counted the labor force (even if they have a part-time job), nor are retired people and people who have disabilities that prevent them from working. People who are currently unemployed, but are currently not looking for a job, are also not counted as part of the labor force – these people are known as Discouraged Workers. Unemployment is calculated by a survey conducted by the United States Bureau of Labor Statistics. One of the questions they ask people who currently do not have a job is “how many hours in the last week did you spend looking for work?”. This question is used to sort people between “Unemployed” and “Discouraged Worker”. Discouraged workers are called “discouraged” because they usually have stopped looking for work because they believe none can be found, that the labor market in their area simply is not creating enough jobs. This can cause the unemployment rate itself to behave strangely when there is an economic recovery – if many new jobs are created but the unemployment rate still goes up, it means that many discouraged workers are re-entering the labor force, which is a sign of economic recovery. Underemployment only refers to when your skills are not being productively used. It does not refer to being underpaid for your work! The unemployment rate also does not include people who have a part-time job because they are unable to find full-time work, or otherwise are working at a job far below their skill level (like an electrical engineer who is temporarily working part-time at Walmart while he continues his job search). Underemployment is a condition that impacts young people (workers between 16 and 24) particularly often. Fresh university graduates might often have trouble finding work in their chosen field, especially after a recession, and so may be forced into a position where they are taking jobs where their education and training are irrelevant. Underemployed workers do reduce the total output, but because these workers do technically have a job, they are not counted at all in the unemployment rate. Discrimination along the lines of race, gender, and age can have serious impacts on the employment levels of each group. This discrimination can even be bigger than the unemployment differences between high school drop-outs and college graduates. The unemployment rate difference between each group is important – it also means that when there is any swing in the average unemployment rate in the full labor force, discriminated groups usually feel a much larger impact than others. 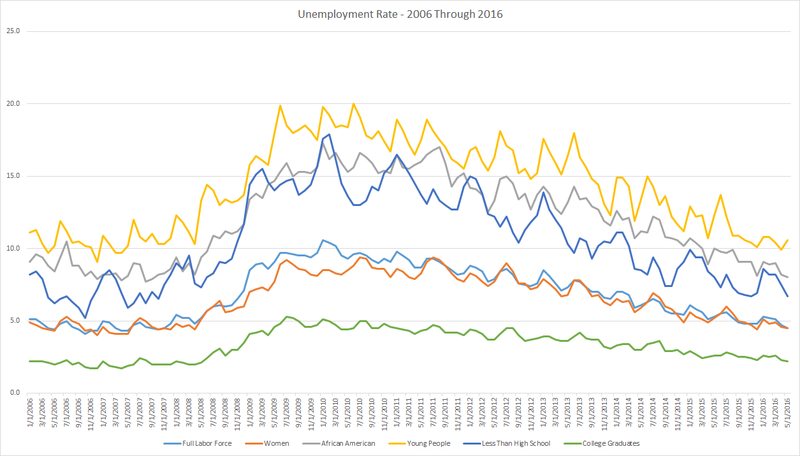 For example, between 2006 and 2010, the unemployment rate for college graduates increased from 2.2% to 5.1% (about 1 in every 20), while the unemployment rate for African Americans increased from 11.1% to 19.8% (almost 1 in every 5). You can look up the unemployment rates over time for different demographics in the United States through the Bureau of Labor Statistics (BLS) by Clicking Here. This does not mean that all unemployment rate differences are due to discrimination. 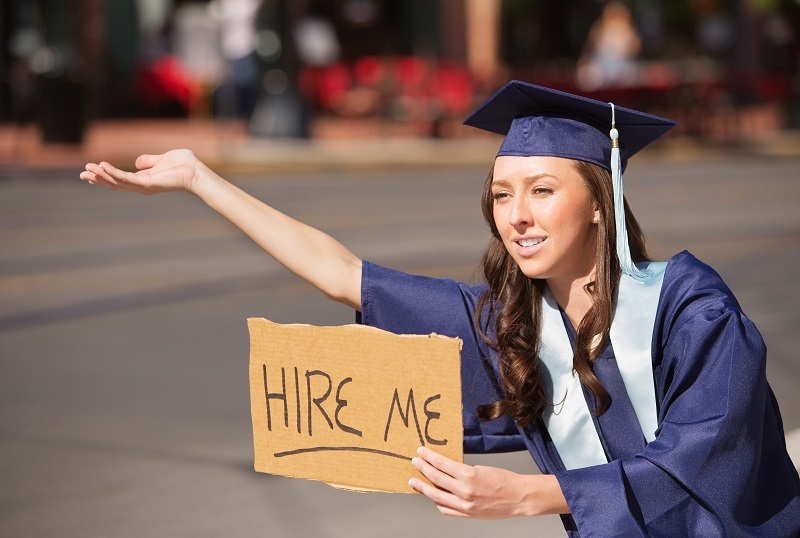 The unemployment rate between college graduates and high school dropouts is quite large, but this can be attributed to a skill difference (college graduates are qualified for more jobs than high school drop-outs), not discrimination. Not all unemployment is created equally – there are different economic factors at play that can create and destroy jobs. Cyclical unemployment is unemployment that is caused by the rise and fall of the Business Cycle. As the economy as a whole grows, jobs are created and unemployment goes down. If the economy starts to weaken, jobs are destroyed as businesses shrink or close. Cyclical unemployment is often what gets the most attention, since it acts as the barometer for the economy as a whole as jobs are lost and created. Seasonal unemployment is the rise and fall in unemployment rates that takes place every year. Each Spring and Fall, farms tend to hire a lot more people to assist with planting and harvest, and those people get laid off at the end of that term. Between November and December, retail firms also tend to hire a lot more cashiers and service people to assist with the “Christmas Rush” of shoppers. In scenic areas, unemployment rates also rise and fall with vacation seasons as hotel staff, park staff, lifeguards, ski instructors, and the like are hired to accommodate tourists, and laid off when the tourism season ends. Generally speaking, the unemployment rate is “Seasonally-Adjusted” by averaging out these high and low seasons. Structural unemployment is harder to specifically count than the other types. This source of unemployment occurs when there is a mismatch between the skills that employers demand and job seekers have. A real-world example of this comes from manufacturing jobs that were lost in the 1980s and 1990s throughout the United States, which coincided with a large number of new jobs being created in web development and programming. Even though there were many new job vacancies being created and firms willing to hire new workers, the people who were unemployed with manufacturing experience did not have the skills necessary to fill those vacancies, leading to a rise in the unemployment rate. Periods of high structural unemployment can be identified by comparing how long it takes for a company, on average, to fill a new job vacancy with the total unemployment rate. If there are large numbers of people unemployed and looking for work, but it still takes a long time for new jobs to be filled, then there is likely a large amount of Structural Unemployment. Frictional unemployment covers people who are unemployed for short periods of time between jobs. For example, if you move to a new city, there will be a few weeks where you are looking for a job even if you find one right away. This also includes people who quit their job to try to find something better, and people who worked for companies that went out of business. Even when the economy is at “Full Employment”, frictional unemployment still exists. 1 of 5) Which of the following people would be considered "Unemployed"? 2 of 5) Which of the following groups have the highest unemployment rate in the last 10 years? 3 of 5) What is Cyclical Unemployment? 4 of 5) Which type of unemployment still exists even when the economy is at "Full Employment"? 5 of 5) Why is unemployment one of the most important economic indicators?